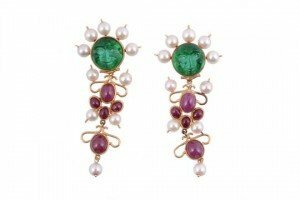 A pair of ruby cultured pearl and green paste ear pendents , the pediments set with pressed green paste faces, suspending cultured pearl and oval cabochon set drops. 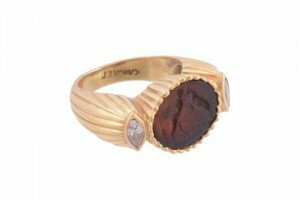 A diamond and paste intaglio dress ring by Chaumet , the brown paste panel with a satyr fighting a goat, between marquise cut diamonds, to a reeded setting, the shank stamped Chaumet. 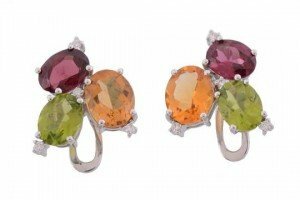 A pair of multi gem set earrings, set with oval cut citrines, peridots and pink tourmaline with brilliant cut diamond accents. 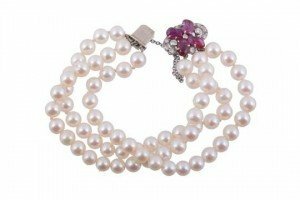 A cultured pearl bracelet with a diamond and ruby clasp , the three rows of uniform cultured pearls to an oval clasp set with brilliant cut diamonds and a quatrefoil of polished foliate engraved rubies. 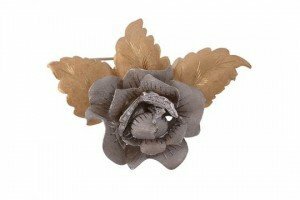 A two colour rose brooch by Fabbrini , the white coloured metal flower head with brilliant cut diamond accents, against gold coloured leaves, signed Fabbrini. 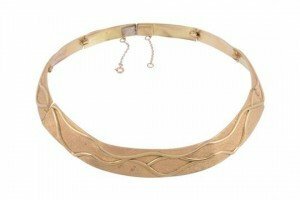 An 18 carat gold collar necklace, the necklace composed of seven graduated textured panels with polished entwining wire detail. 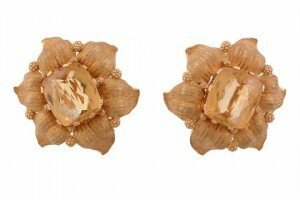 A pair of citrine earrings by Buccellati, the rectangular mixed cut citrines within a gold coloured textured petal surround. 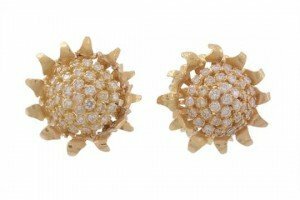 A pair of diamond flower head earrings, designed as a sunflower head, set with a central cluster of brilliant cut diamonds, approximately 2.00 carats total, within a surround of textured petals, with post fittings. A diamond set leaf dress ring, the two textured leaves in a crossover design with a diagonal row of brilliant cut diamonds between. A cultured pearl bracelet, the eleven strands composed of uniform cultured pearls, to a circular disc shaped bone clasp, engraved with Oriental characters. 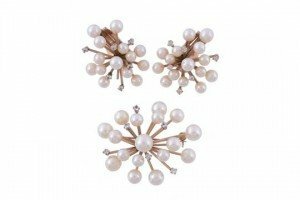 A pair of cultured pearl and white sapphire earrings and a matching brooch, the earrings with radiating bars set with either circular shaped white sapphires or graduating cultured pearls, 3cm long, with stud and clip fittings; together with a matching brooch. 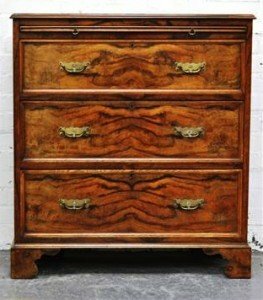 Victorian mahogany bachelors chest, with frieze brushing slide, and with three graduated deep drawers below, brass bail handles, bracket feet. 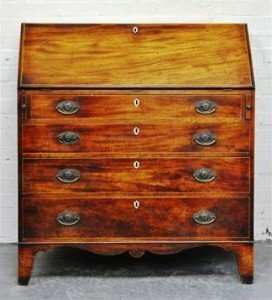 George III mahogany slope and fall front bureau, well fitted interior of drawers and pigeon holes, centred by a cupboard, the base fitted with four long graduated drawers, ivory escutcheons, oval brass plaque handles, bracket feet. 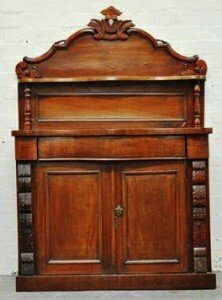 Victorian mahogany chiffonier, shaped back with open shelf, serpentine front, frieze drawer, two cupboards, all on a box plinth. 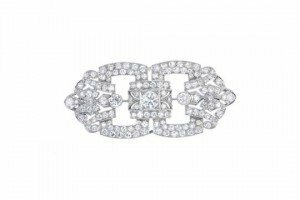 A diamond brooch of openwork design, the brilliant-cut diamond, within a square-shape setting, with similarly-cut diamond collet highlights, to the single and brilliant-cut diamond panel. 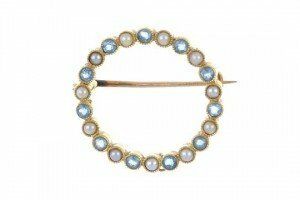 An early 20th century 15ct gold aquamarine and split pearl brooch. Of circular-shape outline, designed as a series of alternating circular-shape aquamarines and split pearls. 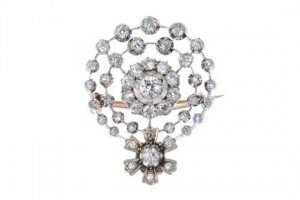 An early 20th century silver and gold diamond pendant. The old-cut diamond cluster, within a graduated old-cut diamond double halo, to the similarly-cut diamond floral surmount. A sapphire and diamond pendant. The pear-shape pink sapphire and brilliant-cut diamond drop, suspended from a marquise-shape diamond and similarly-set cluster, to the integral curb-link chain. 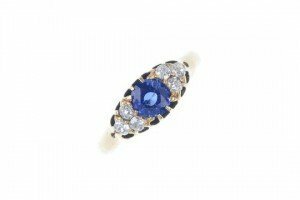 A late 19th century gold sapphire and diamond dress ring. The replacement circular-shape sapphire, to the old-cut diamond trefoil sides and replacement band. Estimated total diamond weight 0.25ct. 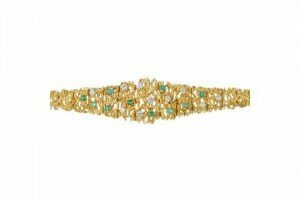 A 1960s 18ct gold emerald and diamond bracelet. Of tapered designed, the bark effect bracelet, with scattered brilliant-cut diamond and circular-shape emerald accents.